Computer vision syndrome (CVS) describes a rapidly growing eye related repetitive strain disorder relating to the use of computer screens, affecting an estimated 90% of workers using computers for more than three hours a day(1)(2). CVSsymptoms are dryness, soreness, irritation and redness of the eyes, headaches, blurred vision, migraines and eye strain while using a computer screen or a visual display unit (VDU). It is believed that the major contributor to CVS symptoms by far appears to be dry eye(2). In the literature, there is evidence supporting the notion that VDU use decreases the blink rate. In an investigation, the blink rate was measured using noninvasive techniques, in relation to VDU use. In normal healthy subjects, the results show an average 5-fold drop in blink rate during VDU use(3). In studies, the decrease in blinking frequency was shown to be an essential cause of dry eye symptoms(4). Blinking not only have the purpose of smoothing the tear film ("windshield effect"), but also affect the composition and stability of the different layers of tears(4). A recent study looked at therapeutic approaches for managing the reduced blinking during computer work. The research was cited in a European Eye Journal. The study showed that a schematic visual representation of a blink presented on a computer screen can increase the blink rate of individuals by 139%(5). A recent paper published by the University of Queensland, Australia discussed a new view that has emerged, one that focuses on the management rather than the elimination of work related CVS issues that are prevalent among eWorkers(6). 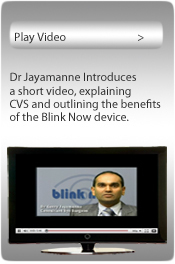 The highly innovative ‘Blinknow” device helps control the work conditions and forms a part of the multifaceted interventions designed to decrease discomfort and reduce the associated economic burden from CVS. Computer Interaction 12 (2000), 107-134. 2) C Blehm, S Vishnu, A Khattak, S Mitra and RW Yee. of visual display unit use on blink rate and tear stability. Optometry and Vision Science 68(1991), 888-92.
perspective on an old problem. Work 2010, 35: 173-181. Are you one of many millions of people worldwide, suffering from Computer Vision Syndrome? Computer Vision Syndrome symptoms are dryness, soreness, irritation and redness of the eyes, headaches, blurred vision, migraines and eye strain while using your computer display screen. If you have any of the above, and the symptoms are gradually getting worse, you may be a sufferer of Computer Vision Syndrome. THIS IS A PROVEN, SIGNIFICANT, EYE CONDITION. YOUR EYES ARE INCREDIBLY VALUABLE – DO SOMETHING ABOUT IT!!! Social networking websites (Facebook, Myspace), watching videos (YouTube), online gaming, email, work and internet study are very much a part of modern life, but how is this affecting the health of your eyes? A major cause of the symptoms of Computer Vision Syndrome is decreased blinking while using the computer. Independent studies have shown that the blink reflex is reduced significantly when at the computer screen. The longer the eye remains open between blinks, the more likely the front surface of the eye is to dehydrate. This leads to dry eyes, resulting in a feeling of tiredness and irritation in the eyes with inability to focus properly after a short period of time. What can we do to address the risk of eye damage from reduced blinking as a cause of Computer Vision Syndrome? It is not possible remind ourselves to consciously blink at the optimal rate for prolonged periods of time, while concentrating on a computer task. Blink Now™ is a unique patented web-cam sized device specifically designed to give you the subconscious physical prompt needed to maintain a healthy blink rate with minimal distraction. The principal behind the device is to create a platform of interaction using your peripheral visual field. Blink Now™ can sit on top or beside your computer screen, whether it is a regular PC monitor or laptop. 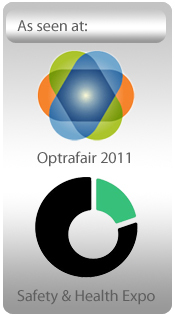 Once Blink Now™ is switched on, it will show an animation of a blinking eye. The blink will be repeated at regular intervals to provide a cue for a scientifically determined healthy blink rate. Computer users respond to this by blinking along with the device subconsciously. Much research has gone into the sizing, brightness, shape and design of the Blink Now™ device to ensure it stimulates your blink rate passively, with minimal distraction. Blink Now™ is convenient to use, drawing negligible power from your computers existing USB port using the USB cable provided, or from a standard power outlet (power adaptor provided) The device does not require any software installation and is locked out from data transfer, preventing any interference with the functionality of your computer in any way. Regular use could have a greater impact on minimising the damaging effects of Computer Vision Syndrome. | | | About Us | Contact Us | Frequently Asked Questions | Links | News | Order / Enquiry Form | The Science | Video | What is Computer Vision Syndrome?